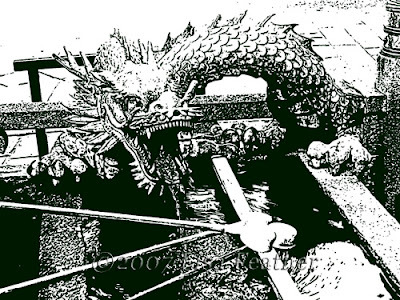 This dragon was found on the grounds of Kiyomizudera, a Buddhist temple located in the Higashiyama district in Kyoto. Such fountains are used for purification. Visitors use the ladles to dip water from the fountain and pour it across both hands. The definition in the scales and form of this fierce looking dragon are bold and impressive and nicely contrast the pooling water below.